How common is the Anatolian Shepherd Dog in Australia? What was the Anatolian Shepherd bred for? What is the general temperament/personality? Can solo Anatolian Shepherd Dogs easily occupy themselves for long periods? Is an Anatolian Shepherd a good family dog? Is the Anatolian Shepherd good with children? Is the Anatolian a breed that a first time dog owner could easily cope with? Are Anatolian Shepherds good with other dogs and animals? How much daily exercise does an Anatolian Shepherd Dog need? How much is an Anatolian Shepherd puppy? How much grooming does an Anatolian Shepherd need? How much does an Anatolian Shepherd weigh? How tall is an Anatolian Shepherd? What should I feed my Anatolian Shepherd? What hereditary problems and health issues should a puppy buyer be aware of? How do I find a good Anatolian Shepherd breeder? What are the coat colours of the Anatolian Shepherd Dog? What is the difference between a Kangal and an Anatolian Shepherd? 1. 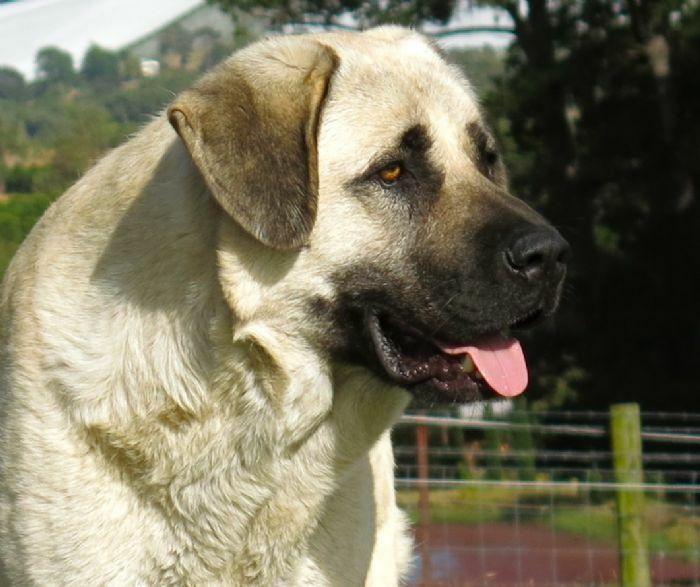 How common is the Anatolian Shepherd or Kangal Dog in Australia? Relatively uncommon, and outside of dog circles, generally unknown. 2. What is the average lifespan? 3. What is the history of the Anatolian Shepherd and what was it bred for? The Anatolian Shepherd Dog (Anadolu Çoban Köpeği) is an ancient breed native to the historical region of Anatolia in Turkey. In Turkey the Anatolian Shepherd Dog, also known as Turkish Shepherd or Kangal, protects flocks and serves as shepherd's companion as it has for millennia. On the high Anatolian Plateau, where summers are hot and very dry and winters are cold, the Çoban Köpegi lives outside all year round. For centuries it was used as a combat dog in war and for hunting. It was particularly valued for the victorious battles it could fight with wolves. As a sheepdog, it was bothered by neither fatigue nor bad weather. Today the Anatolian Shepherd is still used as a sheep dog as well as a guard dog. In Australia, Anatolian Shepherd Dogs are widely used in a working capacity to guard sheep, goats, chickens, alpacas, horses and are renowned for their dedication to their livestock charges, and unsurpassed loyalty to their human handlers. 4. What is the general temperament/personality of the Anatolian Shepherd Dog? The Anatolian Shepherd Dog is a fiercely loyal guard dog and independent and suspicious by nature. They like to observe what is around them and make their own mind up whether something poses a risk or not. The Anatolian is typically alert and protective, possessive of what it regards as its own (be it human family or animal stock) and requires a formal introduction when meeting strangers. In Australia there is no division between working lines or show lines; individual breeders may breed or prefer a certain temperament type. Some Anatolians are good family dogs and some are not. In an assertive rank orientated Anatolian, human aggression is not unusual. Breed fanciers need to keep in mind the Anatolian is a primitive guard dog, and as such individual Anatolian Shepherd Dogs will exhibit traits (to varying degrees) in keeping with this description. 5. Can solo Anatolian Shepherd Dogs easily occupy themselves for long periods? No pack animal likes to spend the majority of its time, in its own company. 'Independent' should not be confused with Isolation, and parallels drawn between a solo working Anatolian living with goats, and an Anatolian living on its own in the backyard. A solo Anatolian Shepherd Dog can certainly find something to do ... a bored Anatolian will almost always find a destructive task (from the human point of view) to occupy itself with, and sometimes a young Anatolian Shepherd will be destructive when it is not bored, but just because it can. From the Anatolian point of view: what does not work the first time, might work the second, and if it adjusts its approach slightly, a different end result might be obtained. Most Anatolians easily work out how to open doors, go through windows and generally get the most out of their environment and any opportunity that presents itself. 6. Is an Anatolian Shepherd a good family dog? Some temperament descriptions state: 'Anatolian Shepherd Dog: good with children'. Frankly, I do not know why they write this. A blanket ‘good with children’ tag for the Anatolian Shepherd Dog is simply not true. Yes, some Anatolians can be very good with young children, but it would not apply to the majority of adult Anatolian Shepherds in Australia. Some Anatolians do not make good people dogs at all (except with their owner). A prospective owner with children, certainly does not want an assertive, rank orientated Anatolian Shepherd Dog living with them in a suburban family home. 7. Is the Anatolian Shepherd Dog too boisterous for very small children or for the infirm? Because of their size and strength, a family Anatolian Shepherd Dog should always be supervised when being the companion of young children. Regarding the infirm: common sense dictates that modern companion purpose breeds are a more appropriate breed choice, over a large, primitive guardian dog. An infirm person cannot properly control their Anatolian Shepherd Dog if the need arises. 8. Is the Anatolian Shepherd a breed that a first time dog owner could easily cope with? 9. Are Anatolian Shepherds good with other dogs and animals? 10. How much daily exercise does an Anatolian Shepherd Dog need? An Anatolian Shepherd Dog living as a working dog will take care of its own exercise (obviously). An Anatolian living as a family dog in a farm or rural environment with large paddocks or acreage to roam, will benefit from and enjoy, a one-on-one stroll or activity with its owner each day. This is also excellent for strengthening bonds and reinforcing leadership. An Anatolian Shepherd Dog living as a family dog in a suburban environment will have more difficulty attaining optimal physical condition with respect to bones, muscles, and general soundness of structure, because the natural ability for the Anatolian Shepherd Dog to move at its own leisure is compromised. That being said, a 1 to 1.5 hour walk every day will be sufficient for an adult Anatolian Shepherd Dog. Although it will not tire an adult Anatolian Shepherd at all, rather give the Anatolian an important and enjoyable activity to undertake with its owner. Adult Anatolian Shepherd Dogs should not be exercised off lead in public places, particularly 'leash free' dog parks. 11. How much does an Anatolian Shepherd puppy or Kangal puppy cost? 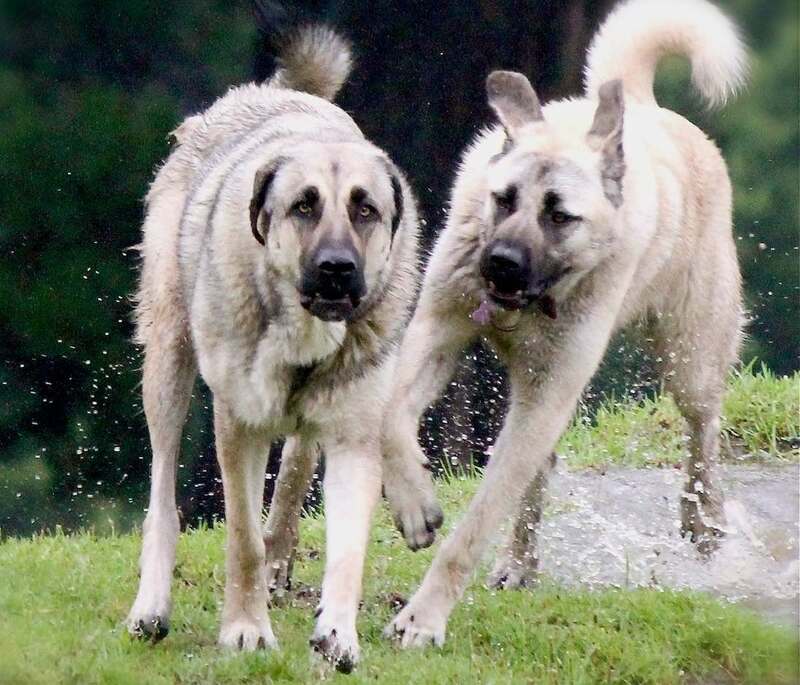 The price of an Anatolian Shepherd or Kangal puppy from an ANKC Registered Breeder intended as a farm / family guardian is usually between $1800 and $4000. However many considerations go into the price of a puppy including its intended purpose (whether the puppy is intended for a pet/family guardian, future breeding dog, show dog, working dog), its pedigree (are the parents imported? Is the lineage proven? What are the achievements or working history of the parents? ), the expertise of the breeder, and the individual circumstance of a particular puppy. Price is variable and therefore prospective puppy homes should always contact the indivudal breeder and ask. 12. How much grooming does an Anatolian Shepherd need? The Anatolian Shepherd Dog has a thick double coat that requires minimal grooming (rough coat varieties require brushing once a fortnight). The Anatolian coat sheds lightly all year round, dropping more coat with the changing seasons. Brushing and washing required is minimal - if the Anatolian gets dirty, the mud tends to dry and fall off their coat and they look clean again. In Turkey the shepherds’ dogs are never brushed, so when they shed their undercoat it gathers like dreadlocks until the coat falls out in pieces likes a shedding sheep. 15. What should I feed my Anatolian Shepherd? The extent to which an Anatolian or any other animal performs in any characteristic, depends not only on its inherent genetic make-up but also on management and environmental considerations. For example, an animal might have the gentic potential to be exceptionally athletic and long living, but unless that animal is kept free of disease and parasites, and unless it is well fed for its requirements and stage of development, it will not be able to express that potential. 16. Are there any common hereditary problems and what health issues should a puppy buyer be aware of? Overall the Anatolian Shepherd Dog in Australia is a robust breed. There are incidences of hip dysplasia and entropion in the Australian Anatolian Shepherd Dog population, but these are not endemic in the breed, nor do they truncate the lifespan of the dog. Cruciate Ligament injury can occur, but it is also a factor of conformation, weight and activity. Mortality in the Anatolian Shepherd in Australia is commonly caused by snake bite. This is not a suprise given most dogs live on farms in rural or bushland areas and being territorial will confront snakes. Either killing the snake, or being bitten, or both. If you have a young Anatolian that kills snakes remember as the dog ages its reflexes will not be as quick as they once were. It is important to know the signs of snake bite, and the snakes in your area. Black Snake, Brown snake and Tiger snake have different initial cues and saving your dogs life will depend on your ability to recognise the emergency and to get to the vet in time - IF you are given the opportunity to realise your dog has encountered a snake. Sadly most owners realise their Anatolian has encountered a snake only after the bite is proven fatal. The second significant mortality factor in Anatolian Shepherd Dogs is Cancer. Hemangiosarcoma and Osteosarcoma onset is usually at middle age, 6 to 8 years. Lymphoma is usually a young dog cancer, the age of onset 2 to 4 years old, presenting as weight loss or anorexia, lethargy and general deteriorating condition and lumps under the skin. Health tests a puppy home should require from their breeder are Hip and Elbow xrays of the parents. Elbows should be 0/0. There is more laxity in the hips. Dogs with abnormal thyroid levels, heart conditions, degenerative joint health, or a poor rate of aging should not be bred from and avoided in the selection of breeding stock. Breeders should know their lines and propensities. In addition to breed research, Anatolian Shepherd Dog owners need to be responsible for their own contribution to their dog's health and well being, and not overfeed their Anatolian Shepherd, as well as ensuring their Anatolian Shepherd Dog has the appropriate level of exercise for its age and environment. Excluding the baby puppy period, Anatolian Shepherd Dogs should be kept lean for the first 12 to 18 months. 17. When buying a puppy, what are the things you should ask of the breeder? Puppy buyers should find an ANKC Registered breeder who will consider the type of Anatolian that will match their requirements as All Anatolian Shepherd Dogs are not suited to All homes. Points to consider: household dynamics (children, other pets), environment (suburban, rural), expectations (ie what you want to do with the dog: stock guard, family companion), and determine a suitable puppy accordingly. Anatolians are not the type of dog where it will benefit the puppy buyer to choose from a litter, which ASD puppy they should live with. An ill matched puppy and home can encounter problems as early as their first week together - if you find your ASD puppy is more of a challenge than you expected, then contact your breeder asap ... Anatolians rarely change their mindset, but we can change the way in which an Anatolian is managed.